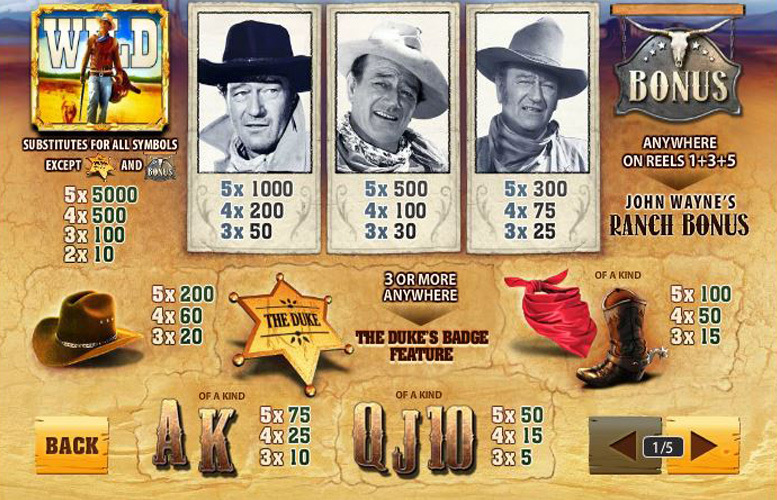 Join “The Duke” – the king of the Western – in Playtech’s homage to the legend that is John Wayne. Understandably, it’s cowboys, 10-gallon hats, and sheriffs, all set in a typically one horse town. It’s a smart machine that’s colour scheme, and imagery matches the theme well, and the harmonicas and sliding blues guitars are just the perfect accompaniment. In terms of specifics, it’s a 25 line, five reel, three row slot machine. There’s a couple of great bonus features too that can quickly send winnings skywards. So, saddle up already, cowboy. Great looking, and feeling machine. The soundtrack, imagery, and colour scheme match the theme exquisitely. Couple of great bonus rounds that are innovative whilst also remaining relevant to Wayne’s movies. Not everyone is a huge fan of the Western genre. Those who aren’t familiar with Wayne’s work may struggle to find enjoyment with this slot. John (black hat) = 1000x the line bet. John (white hat) = 500x the line bet. John (brown hat) = 300x the line bet. Cowboy hat = 200x the line bet. Bandana, or Boots = 100x the line bet. 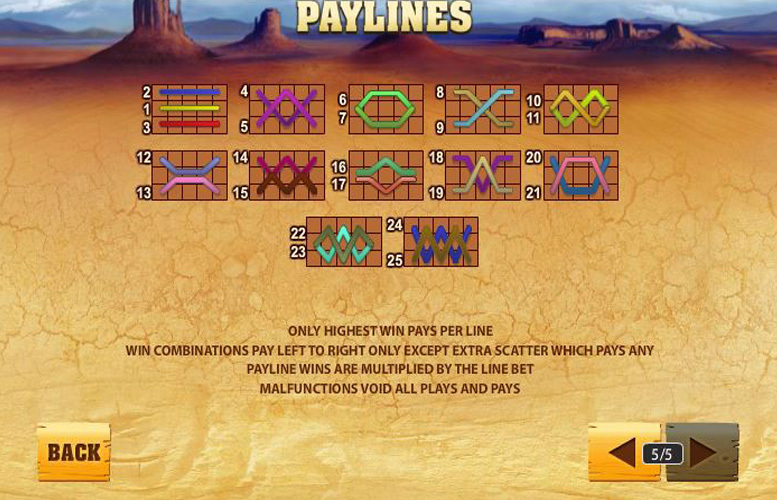 Based on the maximum line bet of £50, the highest win possible is a spectacular £250,000. 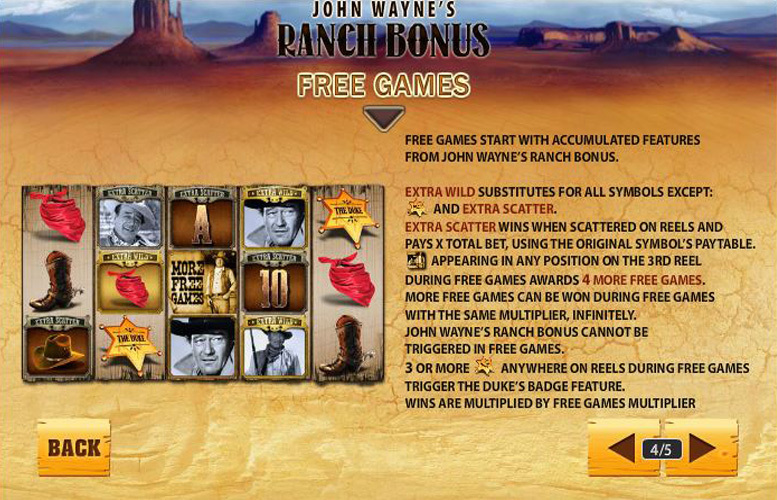 The John Wayne slot features some great bonus rounds which really help to bring the slot alive. They play on some classic slot machine concepts, whilst also working well with the general cowboy theme. 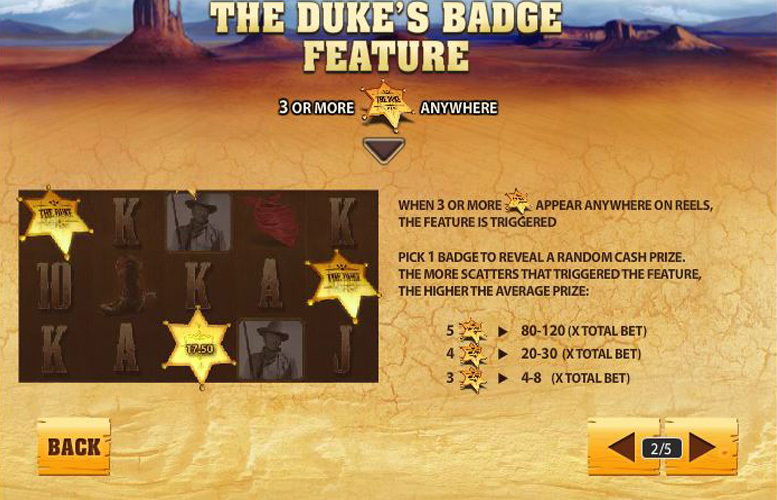 The game’s scatter symbol is a sheriff’s badge that’s labelled “The Duke”. If players are fortunate to land three or more of these anywhere across the reels, they’ll activate the Duke’s Badge Feature. Here, the reels darken around the badges and the game prompts players to select one of them to reveal an instant cash prize. The more badges that triggered the feature, the higher the average prize. According to the game notes, five, four, or three badges will award players around 80 to 120x, 20 to 30x, or 4 to 8x the total bet respectively. The game’s Bonus symbol looks like a saloon sign, complete with bison skull. 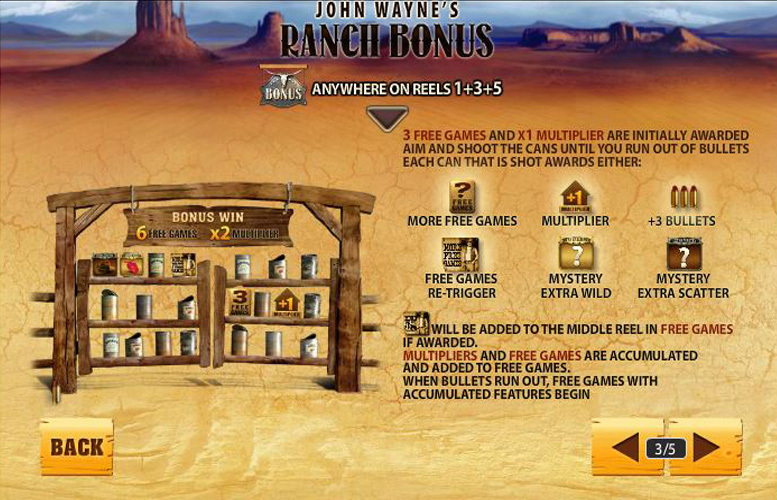 Landing it anywhere on reels one, three, and five simultaneously will activate the John Wayne’s Ranch Bonus round. The default prize here is three free spins with a 1x multiplier, but players must shoot cans in a tin-can alley style game to reveal additional prizes. Available beneath each of the targets are random additional free spins, additional multipliers, extra bullets to try for more rewards, an extra free games retrigger symbol for the central reel, a mystery extra wild, and a mystery extra scatter. Ace, or King = 75x the win line. Queen, Jack, or 10 = 50x the win line. The John Wayne slot machine caters for all budgets. The lowest bet possible is a miniscule 1p. This is with using the minimum bet per line, and the minimum line setting of one. By contrast, the largest wager a player can make is £50, across all 25 available win lines. This makes the maximum bet possible on John Wayne is a colossal £1,250. 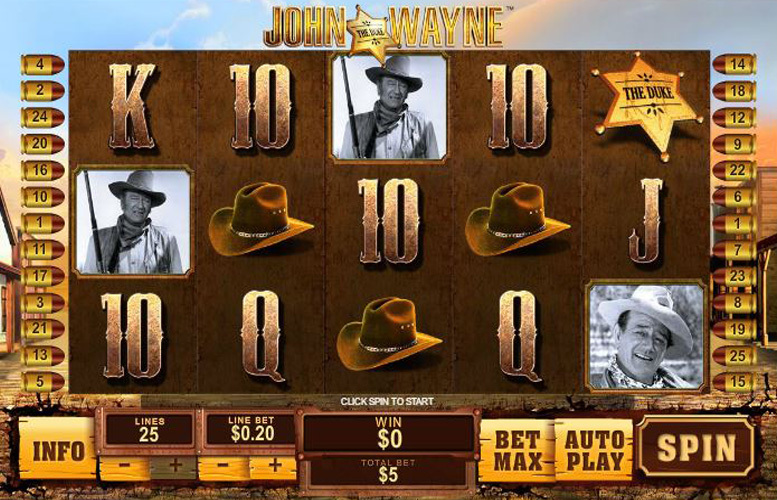 For those who love the Western movie genre, the John Wayne slot machine is an absolute must. It pays homage to the great actor’s work through smart choices with colours, graphics, and its soundtrack, and has some great bonus rounds to boot. This game has a rating of 5 / 5 with 241 total reviews by the users.